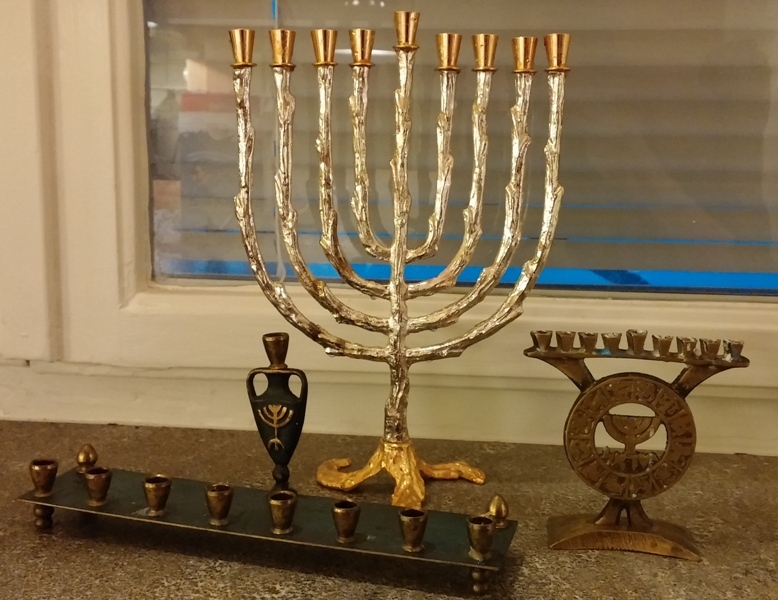 Tuesday, December 20 – the 12th day I am here with my mom and the first night of Chanukah. And I am not with my son or husband this year to take out the candles and organize the celebration or even to make latkes. 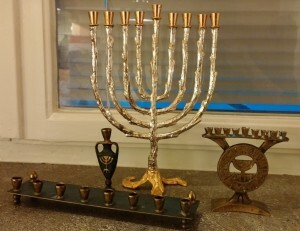 But my husband called me on SKYPE and asked where the menorah was and if there were any candles. I told him where the menorah was kept and that candles were in the same place. So after about 15 minutes he SKYPED me again and I could join them for the Chanukah candle lighting and watch Bevin say the prayer. Its a Star Trek world and videophone is alive and well. But as far as latkes are concerned they will probably have to wait till I get back home. Last night I met with my mom’s doctor. I want him to tell me how my mom is. Actually, I want him to play God – to know how long she has left, to tell me for certain. But he isn’t God – just an ordinary, geriatric specialist type of doctor and he doesn’t know. I asked him if we could take a few blood tests to see how her body chemistry is but he said if we do that and discover how badly she is doing then he would have to do something to try to fix it. Because he is a doctor. So we will just let her be, let her body do what it has to do. So I wait. I sit in her room, sometimes next to her bed, sometimes in front of my computer. I help to feed her. She is given puréed food now. She would at least open her mouth when she felt the spoon near her lips. But now she is hard to wake up for meals. She sleeps. Peacefully. Seemingly without pain. And I wait. And tonight has become Wednesday already, the second night of Chanukah, commemorating God’s miracle of light. When I was 10 years old I was in love with Peter Pan. But, I don’t mean in the way that young girls have crushes on pop stars today. I was in love with the island of Neverland and Peter, and his adventures with all the creatures there. Around that time period, Mary Martin’s performance as Peter Pan was shown on TV. While my memories of my childhood experiences are subjective and full of gaps, the Internet helps fill in the holes. According to IMDB, Peter Pan, with Mary Martin, was telecast the first time in 1955 and again in 1956. A videotaped version from 1960 was televised again in 1966 and even in 1973. I’m not certain if I saw the 1955 and 56 versions, I was only 4 and 5 years old at the time, but we had a TV so it was possible. I definitely saw it in 1960 and 1966. I probably also saw the earlier versions since by the time I was 9 in 1960, it seemed to be familiar already to me. I loved it. In just a few days, Chanukah, the Jewish festival of lights, will start. I wrote this piece sometime in 2004 but since its that time again I thought I would put it up now. A few things have changed since I wrote it. My son is no longer in 1st grade but in his last year of school before going on to college next fall. We eventually did do a presentation of Passover when he was in 4th or 5th grade, which was a big success. The Swedish Church has now been separated from the state and is trying to figure out how to survive in this very secular country. In the spring, Bevin will have a course called “Religion”. We’ll see just how multi-cultural the class will be. Maybe Bevin will have to give a talk about his religion once again. Moving from the United States to a land like Sweden is often fraught with surprises. Of course one expects to find differences – the language for instance, or foods like Falukorv and Tunbrödsrullar, and Lutfisk. Clothing and shoe sizes are different and so are the measuring cups. Remember the metric system that the states spent 30 years trying to introduce and failed? Well it’s here, in use every day. And don’t forget the price of gasoline – 4 dollars a gallon! And how about liqueur stores open on Saturday night so you can buy a last minute bottle of wine for the dinner party you just got invited too? Well, forget it! But overall, there are a lot of similarities too. Cars drive on the right side of the road. Traffic lights are red, yellow, and green. The Big Macs taste the same. So do the Kellogg’s Corn Flakes. TV shows from the States are all in English as long as they are for people over the age of 7 or 8. You can watch British Masterpiece Theater programs (often before they arrive in the States) though they are not called Masterpiece Theater here. The clothes people wear are often produced in the Far East and lots of the toys are made in China. Barbie is easily available and so are potato chips and microwave popcorn. Its when you find differences in areas you didn’t expect that you get surprised. Once again this is something I wrote awhile ago, around 2004. In the years that have passed, my son has had his Bar Mitzvah and I now sit on the board of an organization called Progressive Judendom i Stockholm. We are working to bring Reform Judiasm to Stockholm. And the group of J.A.P.S. that formed all those years ago still (with some comings and goings) meet for holidays and other times. Our children are like cousins to each other and the adults in the group are more than just friends. They have become family. It’s funny how things change the older one gets – one’s sense of immortality, one’s idea of how to live a good life, the color of one’s hair, the list of things that are important. I’ve spent a long time living here in Stockholm. I’ve spent an even longer time being Jewish – pretty much from birth, actually. My parents were Jewish. Both sets of grandparents were also Jewish. All my family and the relatives around me were Jewish. But I didn’t grow up in a Jewish neighborhood. From the time I was 4 years old till I was 18, I lived in a small town in the middle of northern New Jersey. All through grammar school I was the only Jewish kid in my class. And if there were any Jewish kids in the large regional high school I attended, I didn’t know them. I always had to get special permission to be absent from school on Rosh Hashanah and Yom Kippur. I then had to explain to my friends why I wasn’t in class. Getting permission wasn’t a problem and the explanations finally became routine but having to go through that process did contribute to making me feel different from all the rest.